Kids' Book Review: Review: How did I get here? Review: How did I get here? 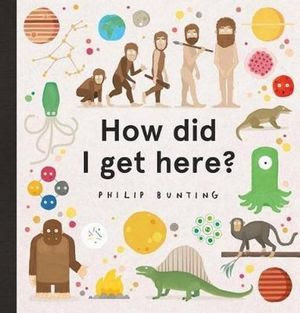 From the Big Bang to birth, Philip Bunting's new book, How did I get here? is a great introduction to the history of life. Bunting uses the familiar to explain the unfamiliar. He deftly uses food analogies, language from fairy tales and favourite childhood animals to highlight the vast science topics of astronomy, biology and evolution of life on Earth. Sitting beside the simple language are illustrations, flow charts, diagrams, maps and time lines that assist with the understanding of this information. Bunting's abridged biography of life will have your primary school aged children asking even more questions about the creation of the universe, life on earth and how we are all made from star dust. To explore more about of the themes in How did I get here? see; The Big Earth Book, Destination: Space and The First Earth Encyclopedia. If you love humourous stories see these Philip Bunting stories; Koalas Eat Gum Leaves, and Kookaburras love to Laugh.